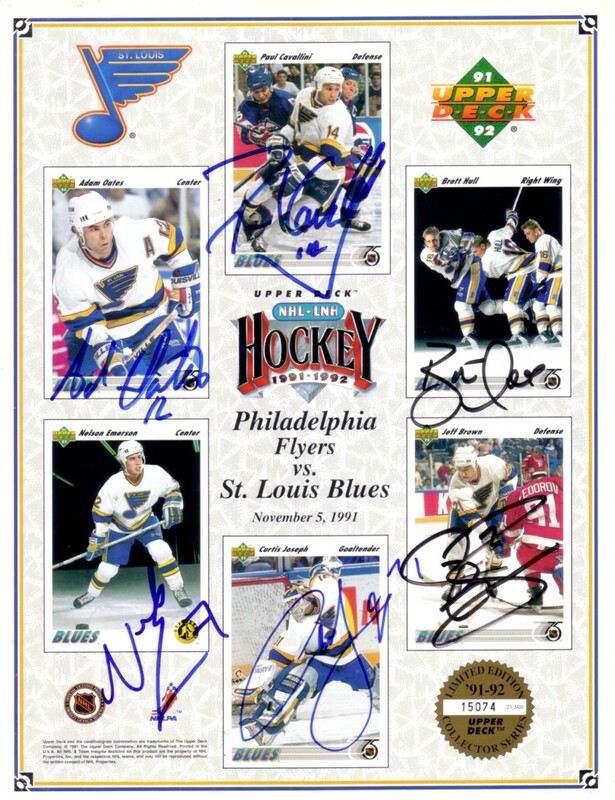 8 1/2 by 11 inch 1991-92 Upper Deck card sheet distributed exclusively at the Nov. 5 St. Louis Blues home game vs. Philadelphia, autographed by all six players featured: Jeff Brown, Paul Cavallini, Nelson Emerson, Brett Hull, Curtis Joseph and Adam Oates. Has minor wear. Completely signed sheets are extremely rare. Obtained in person. With certificate of authenticity from AutographsForSale.com. ONLY ONE AVAILABLE FOR SALE.